When an alternating potential difference is applied across two conductors whose spacing is large as compared to their diameters, then the atmospheric air surrounding the conductors is subjected to electrostatic stresses. At low p.d. between the conductors, there is no change in the condition of the air around the conductors. However, if the voltage is gradually increased, a stage is reached when a hissing noise is heard and there appears a glow of violet color around the conductor. This is known as corona effect in transmission lines and is always accompanied by the production of ozone gas. The glow is due to the fact that air around the conductor becomes conducting due to the electrostatic stresses. If p.d. is further increased, the intensity of sound and glow will increase till flash over occurs between the conductors due to the breakdown of air insulation. The phenomenon of hissing noise, violet glow and production of ozone gas in an overhead transmission line conductor is known as corona effect in transmission lines. If the conductors are uniform end smooth, the corona glow will be uniform throughout the length otherwise the rough points will appear brighter. In the case of DC system, the glow due to corona effect in electrical transmission lines will be different in the two conductors. The positive conductor has smooth and bright glow whereas the negative conductor has a spotty glow. If the spacing between the conductors is small, flash over may take place between the conductors without any hissing noise and glow. It is because the distance between the conductors being smaller, there is no time for the glow to occur. 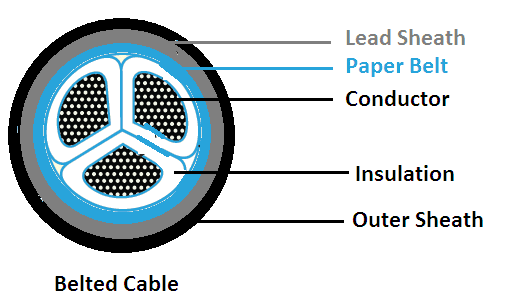 Conductors shape: The corona effect in transmission lines depends upon the shape and conditions of the conductor. The rough and irregular surface will give rise to more corona. It is because unevenness of the surface decreases the value of breakdown voltage. Similarly, a stranded conductor has the irregular surface and hence gives rise to more corona than a solid conductor having the smooth surface. Atmosphere: Since corona is caused due to the ionization of air surrounding the conduction, therefore, it is affected by the physical state of the atmosphere. In the stormy weather, the number of ions is more than normal and corona occurs at much less voltage as compared with fair weather. Spacing between conductors: If the spacing between the conductors is made very large as compared to their radii (r), there may not be any corona effect. It is because larger spacing reduces the electrostatic stresses at the conductor surface. Line voltage: Line voltage greatly affects corona effect in transmission lines. If it is low, there is no change in the condition of air surrounding the conductor and hence no corona. However, if the line voltage has such a value that electrostatic stresses developed at the conductor surface make the air around the conductor conducting, corona effect appears. Due to the formation of the corona, the air surrounding the conductor becomes conducting and hence the virtual diameter of the conductor is increased. The increased diameter decreases the electrostatic stresses between the conductors. The corona effect in transmission lines reduces electrostatic stresses between the conductors. This reduces the probability of flashover and improves the system performance. Corona reduces the effects of transients produced by lightning. The corona effect in electrical transmission lines is accompanied by a loss of energy which is dissipated in the form of light, heat, sound and chemical action. On the formation of the corona, ozone gas is produced which chemically reacts with the conductor, causing corrosion. The current drawn by the line due to corona loss is nonsinusoidal and hence non-sinusoidal voltage drop occurs in the line. This may interfere with the neighboring communication lines. By increasing the conductor size: By increasing conductor size, the voltage at which corona occurs is raised and hence corona effects are considerably reduced. It is due to this reason that ACSR conductors which have, a larger cross-sectional area are used in transmission lines. By increasing the spacing between the conductors: By increasing the spacing between conductors, the voltage at which corona occurs is raised and hence corona effect can be eliminated. However, spacing cannot be increased too much otherwise the cost of supporting structure may increase too much. connect a circuit conductor or other device to an earth-plate. high temperature of the conductors. service points to consumer premises. © https://yourelectricalguide.com/ Corona Effect in Transmission Lines.